Today is the day we leave for Houston. I woke up at 4:45 (ughh) in order to start my pre departure routine. As many times as we have been on road trips this year, I’m getting quite good at this. After making my coffee (important things first), I administer a half dose of tranquilizer cleverly hidden in a piece of cheese to Buster. For some unknown reason he has developed a phobia of being in the car and I don’t know why as he rides into work with me nearly everyday. 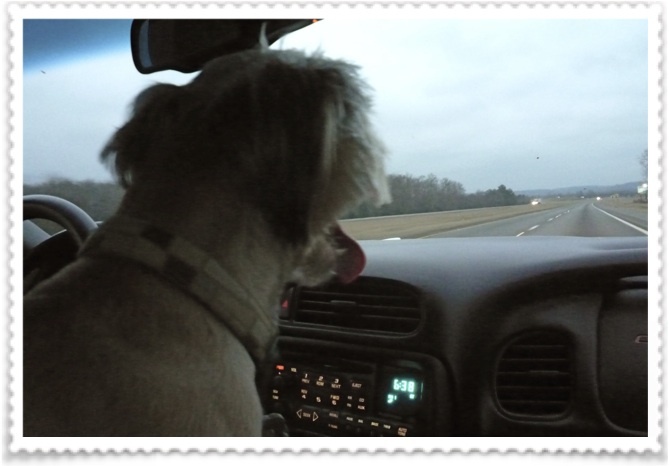 In any case whenever we go on a trip we now have to give him Doggie Valium just to make the trip tolerable. Buster and I then head out on our walk which gets the blood flowing in both of us and moves the tranquilizer through Buster’s system a little more quickly. When we return I chug a cup of my beloved coffee and hit the shower. I packed all of our suitcases last night and Rod managed to barely squeeze them into the Corvette. He says we’ll need a crow bar to get them out again. 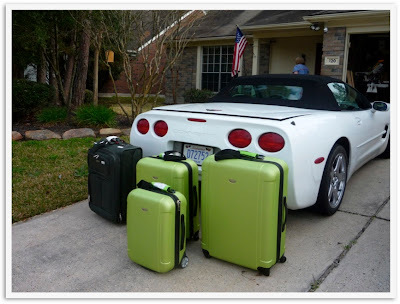 Can you believe we got all those suitcases in the Corvette trunk? At 5:30 as usual Rod is telling Buster that I’m running late and holding up the train. We go through this every time. The night before we leave on a trip, I ask Rod what time we will be leaving and he normally says 6:00 am, but somehow the time magically gets pushed up about 30 minutes by the morning and he swears he didn’t tell me we were leaving at 6:00. After I shower, dress and put just enough makeup on so as not to embarrass myself I start throwing things into the backpack and making a last minute check. Lindsay slumps out of her room to say goodbye and sheds a few tears. She hates it when we leave and says it’s because she hates being alone. Rod and I are still trying to figure this one out because when we are home we may only see her twice a night. Once when she cruises into the kitchen for a snack and another time when she comes out to say good night. The rest of the time she spends in her room watching T.V. or on her computer. We leave at 6:00 on the dot. I throw the backpack, pillow, my travel purse and Buster into the car and off we go. Buster does his usual routine for about the first hour and frantically paces and pants continually, all the time breathing his dog breath on us. The tranquilizer finally takes affect on Buster and the lack of sleep on me and we both succumb to a nap. Every time we drive to Houston and the weather is cool enough to leave Buster in the car. 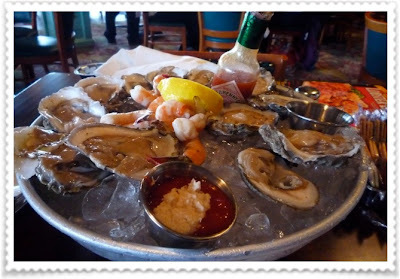 We stop at one of our all time favorite restaurants, Pappadeuxs. We always start with oysters on the half shell and Rod usually gets a seafood platter. 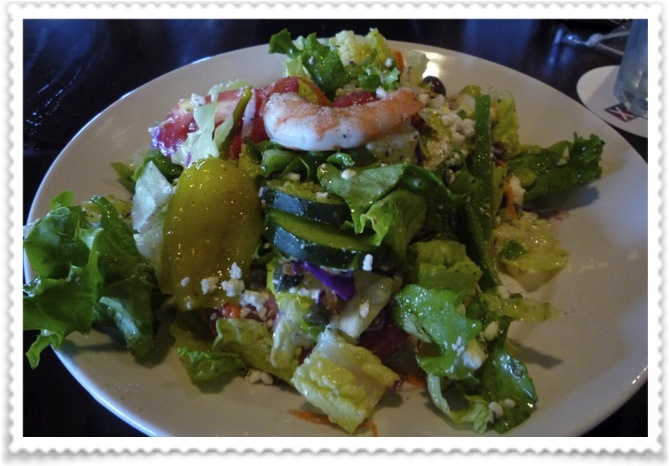 I always get the same thing, a Greek Salad with everything in it. Pappadeuxs has the best greek salad ever, I don’t know if it’s the fresh lemon juice they squeeze on it before dressing it or the house made Greek dressing. Rod was feeling adventurous this time and decided to try something different. Out came a beautiful plate with stuffed lobster and crawfish etouffe, boy was he glad he got that it was delicious. After dinner we piled back in the car for the last hour and a half of our trip. By the time we pulled into Mom and Dad’s driveway we had to be peeled out of the car. After welcoming hugs and kisses Rod sat down to watch the remainder of the Super Bowl and I of course sat down to my computer.